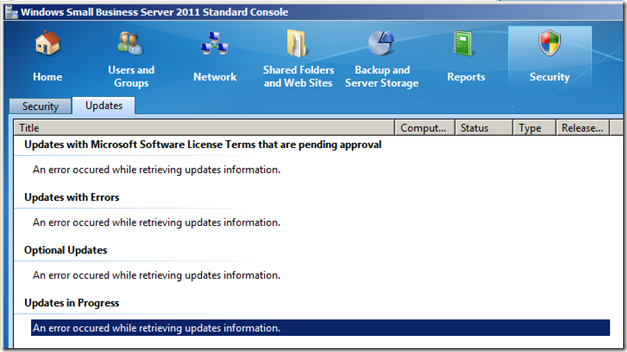 I was investigating a fault today for a client – their new SBS 2011 server had stopped working with WSUS. As my investigation went on I found that this issue would also affect the SBS Client Connect as well as other web based applications on this server. The SBS console was reporting “An error occured while retrieving updates information.” as the screen below shows. I did some digging and found that the WSUS console was broken too. The event logs showed the error below. ISAPI Filter ‘C:\Windows\Microsoft.NET\Framework\v4.0.30319\\aspnet_filter.dll’ could not be loaded due to a configuration problem. The current configuration only supports loading images built for a AMD64 processor architecture. The data field contains the error number. To learn more about this issue, including how to troubleshooting this kind of processor architecture mismatch error, see http://go.microsoft.com/fwlink/?LinkId=29349. Look closely and you will notice above that there’s a double \\ in the path name. Once I’ve modified it to remove the double \\ and done an IISRESEt – it’s all working just fine. The picture below shows the problem line AFTER I’ve modified it. Thanks so much for this. Such a strange error to occur and how is it not even fixed by MS yet!? Anyway just wanted to say thanks as this error was doing my head in. It fixed the error but I also needed to restart the server to get WSUS to synchronize. Thank you! Exactly the same issue here. 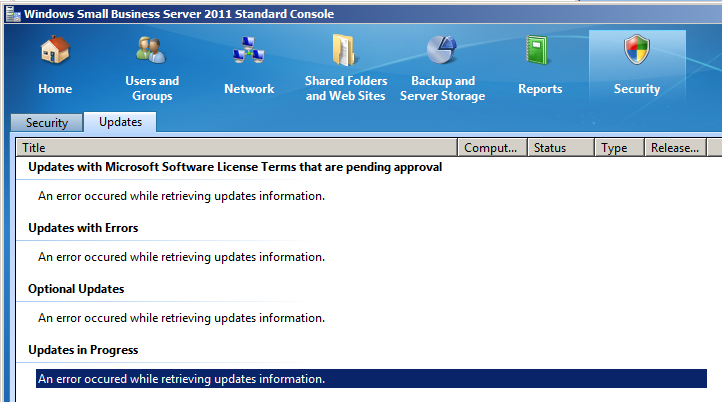 I was made aware of the problem when my SBS Console updates panel displayed the above messages. Remove the extra backslash, restart the Update Service and away we go! Suspect windows updates to the server broke it somehow.